The Aurora Borealis (Northern Lights) is occasionally visible from the United Kingdom, usually Scotland, Northern Ireland and Northern England. On rare occasions, and with the right conditions, the aurora can be seen further south. The Aurora Australis (Southern Lights) is the Southern Hemisphere equivalent. The following images show forecasts for both. 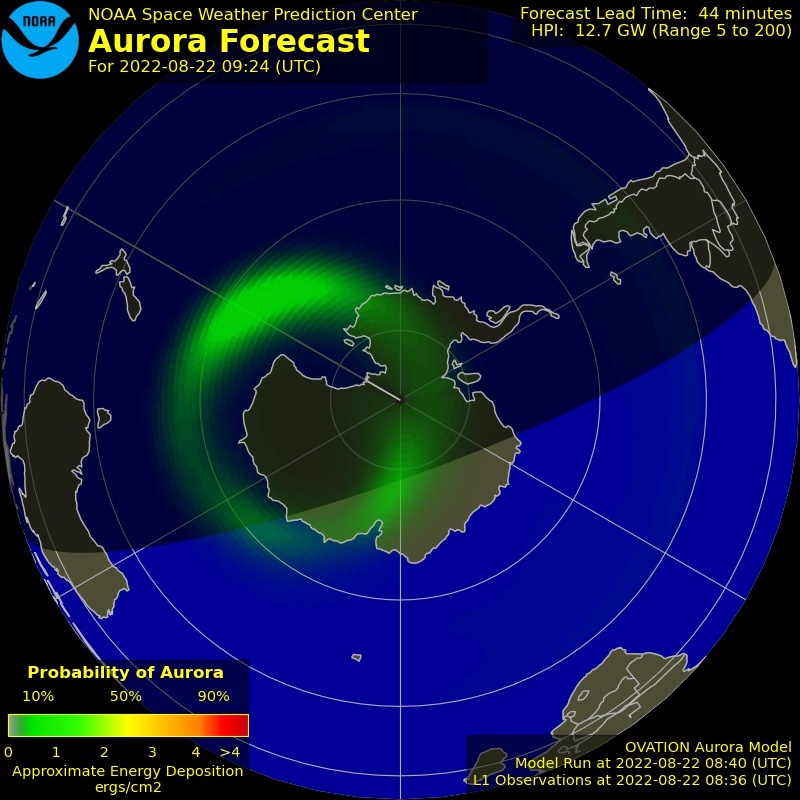 Click on either image for more information and to show the forecast animation, click 'Aurora - 30 minute forecast' (opens in a new window). Ovation is an empirical model of the intensity of the aurora. This model is driven by solar wind data from the ACE satellite. When the proton level gets high enough, the ACE solar wind sensors become contaminated and the Ovation model produces an inacurate forecast. 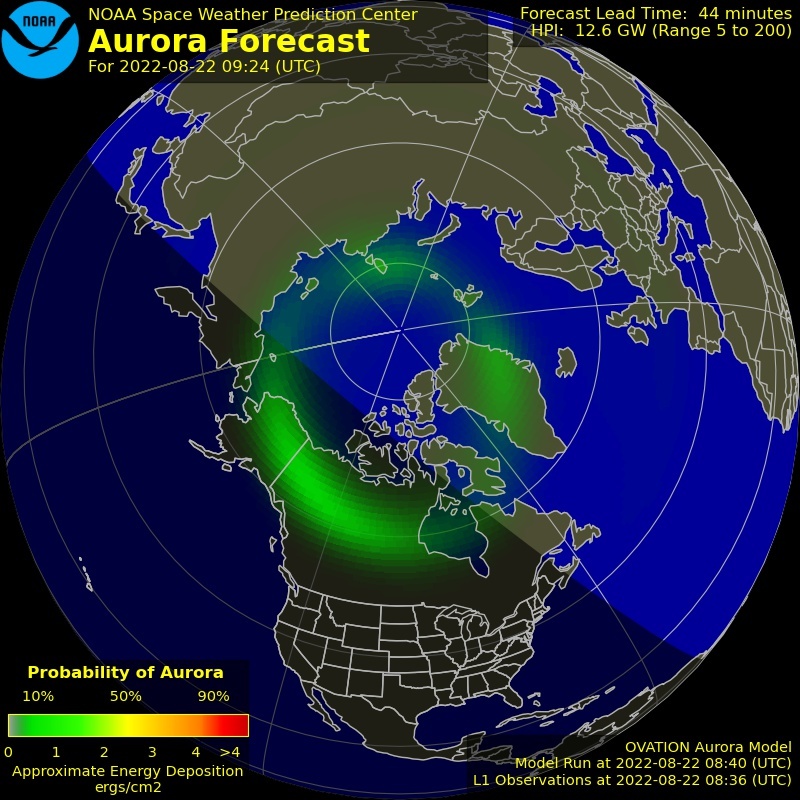 The display shows the intensity and location of the aurora as expected for the time shown at the bottom of the map. This forecast is based on current solar wind conditions and the average time for the solar wind to propagate from the ACE satellite at L1 to Earth. The model produces an estimate of the intensity of the aurora. In this product a linear relationship between intensity and viewing probability is assumed. This relationship was validated by comparison with data from the UVI instrument on the NASA POLAR Satellite. The sunlit side of Earth is indicated by the lighter blue of the ocean. The sub-solar point is also shown as a yellow dot but only if the sub-solar point is in the view of the chosen image. The day-night line or terminator is shown as a yellow line. Note that the aurora will not be visible during daylight hours and it may be an hour or more before sunrise or after sunset that the aurora can be seen from the ground. The red line about 1000 km equatorward of the aurora indicates how far away viewers on the ground might see the aurora assuming good viewing conditions. © n3kl.org. Click here for more detail.